FILE - A market vendor stands among a group of women waving Liberian and American flags to show support for visiting U.S. Secretary of State Hillary Rodham Clinton, in Monrovia, Liberia. Obama recently lifted US sanctions on Liberia. Liberia has welcomed the lifting of U.S. sanctions that were imposed on the country in 2004 by then President George W. Bush. In letter to the speaker of the U.S. House of Representatives and the president of the Senate, U.S. President Barack Obama said Liberia has made advances to promote democracy and the orderly development of its political, administrative and economic institutions. Obama cited Liberia’s two consecutive democratic elections (2005 and 2011), the conviction of former president Charles Taylor and what he called the diminished ability of those connected to Taylor to undermine Liberia’s progress, as well as the lifting of a U.N. assets freeze on Liberia. Information Minister Lewis Brown said the lifting of the sanctions should inspire confidence that Liberia is a country open and ready for development. He also said it shows that Liberia is a shining example of what a country, once considered a failed state, can achieve by a united people under a decisive leadership that is dedicated to strengthening the tenets of democracy. “Since the end of our conflict, we’ve worked as a government and as a people to deepen our democracy, to rebuild our institutions, to get our economy back on track. And so we’re pleased by this development, especially in the light that it takes into account the enormous progress that this country has made,” he said. 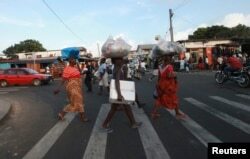 FILE - People cross a road in Monrovia. Brown said Liberia’s sense of freedom is best tested by the wave of press freedom, freedom of speech and of worship that Liberians enjoy under the government of President Ellen Johnson Sirleaf. But the Obama administration said much remains to be done in Liberia, including transferring security responsibilities from a U.N. mission to Liberian forces next year, and holding national elections in 2017. Brown expressed appreciation to the United Nations Mission in Liberia (UNMIL) for providing the necessary training and mentoring. But he said Liberia is ready to take over its own security. “Each day we take a step toward being ready; each day we take a step toward achieving those milestones, and that is all that anyone can ask for, that each day Liberia remains steady toward making progress in deepening its democratic institutions, deepening its aspirations to become a society that is free, a society that is secure not necessarily by armament but by shared values of commitment to the rule of law, commitment to transparency, commitment to an open government that is responsive to the needs and aspirations of its people,” Brown said. The U.S. government's and the United Nations' assets freezes and travel bans were imposed against those individuals considered dangerous to Liberia’s security. But two months ago, the United Nations lifted its assets freeze and travel ban. The U.S. Treasury Department maintained its sanctions on businessman Benoni Urey, a former Taylor associate who is now a candidate in Liberia’s 2017 presidential election. According to one Liberian government source, President Sirleaf personally lobbied both the United Nations and the U.S. government to lift all sanctions. The source, who requested anonymity in order to speak about the matter, said there has been concern that if all sanctions are not lifted and elections are held in 2017, some candidates or their supporters may claim that the atmosphere was not conducive for free and fair elections.